Readers who have been following my posts may know that I was a bridge design engineer some decades ago. I am delighted that this week’s Sunday Stills is Bridges – which is my favorite subject. Here I try to group some masonry bridges together. They look aesthetically pleasing, simple and some of them even romantic. They have helped our ancestors to cross over many troubled waters – a big contribution to our present civilization. My bridges here are mainly masonry. The masons carved the stones into blocks of various sizes, assembled them together in a form designed by engineers who were masters of art and also structural engineering. They were skillfully laid into an arch form so that most part of the bridge are in compression – their creative thinking has helped humans to connect on both sides of the rivers. I will start off with some bridges in Europe. The first bridge is the one I encountered at Seville, Spain – the reflection in the water is just fascinating! The other one is the one at Cahorrs, France. This is one of the most romantic bridges I have ever come across. 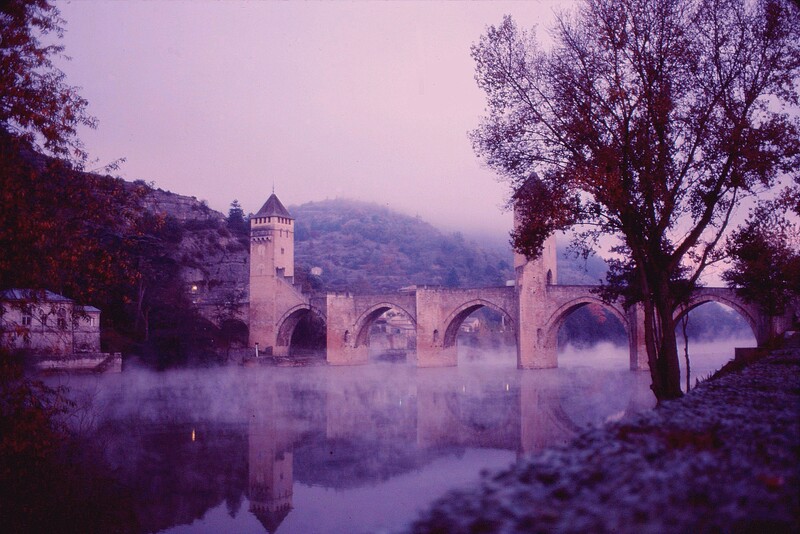 The picture was taken in 1985 and I was only able to identify that this is the medieval Valentre bridge after matching it with internet pictures. A famous bridge in Venice which has been shown on many photos. I like the cover on the bridge, unfortunately, I do not have a close up of the bridge. This is another bridge with photo taken in 1985. If memory is correct, this is a bridge in Toledo, Spain. 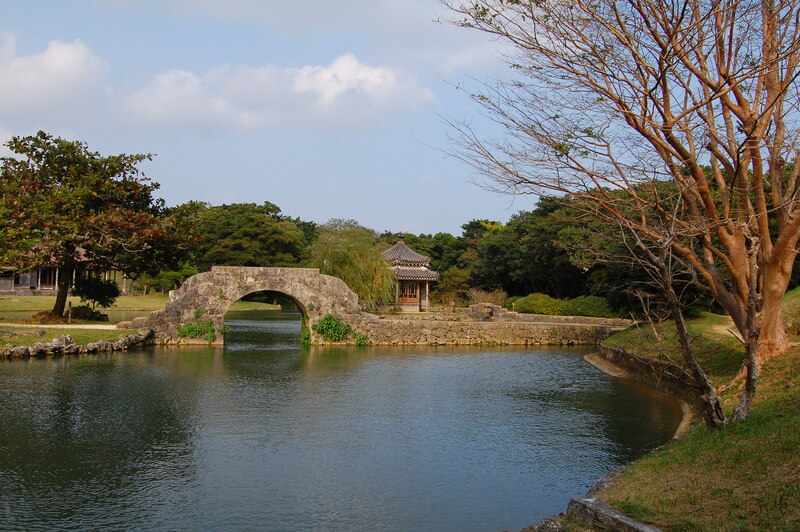 This is a primitive style single span bridge in a Chinese style private garden in Okinawa, Japan. 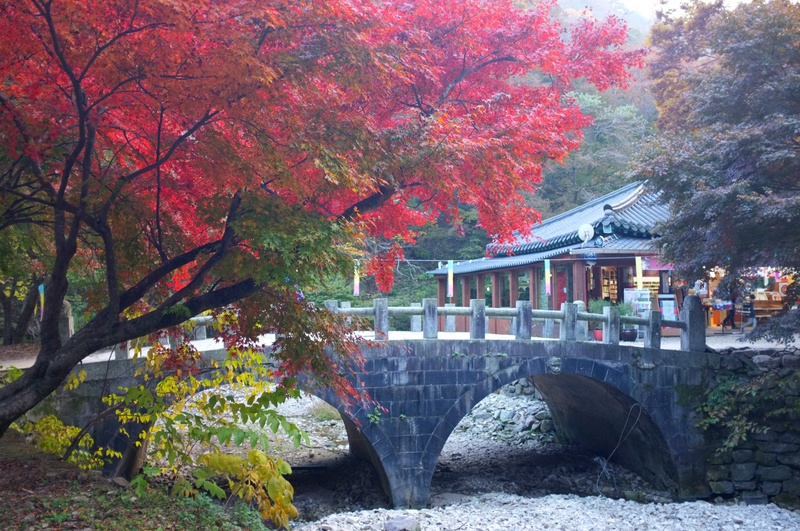 A picture I have taken recently in my travel to Naejongsan in South Korea; a two span bridge overshadowed by red foliage. The principle of aesthetics dictates that bridges look more pleasing with an odd number of spans – so this one deviates from this principle. 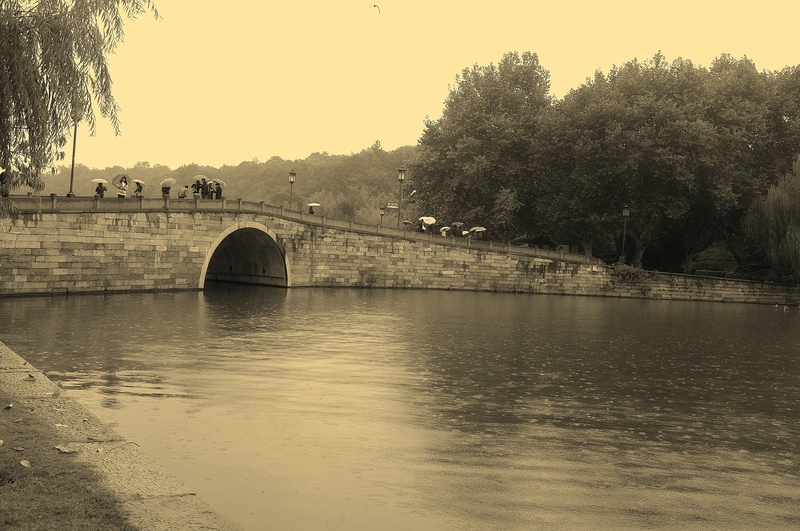 A Chinese style arch bridge with photo taken in the rain in West Lake, China – people in umbrellas and ripples in the water add moods to the image which is changed to a sepia. Another bridge with three spans which appeared in my earlier post. however, this is a real Still one and the atmosphere is so serene. 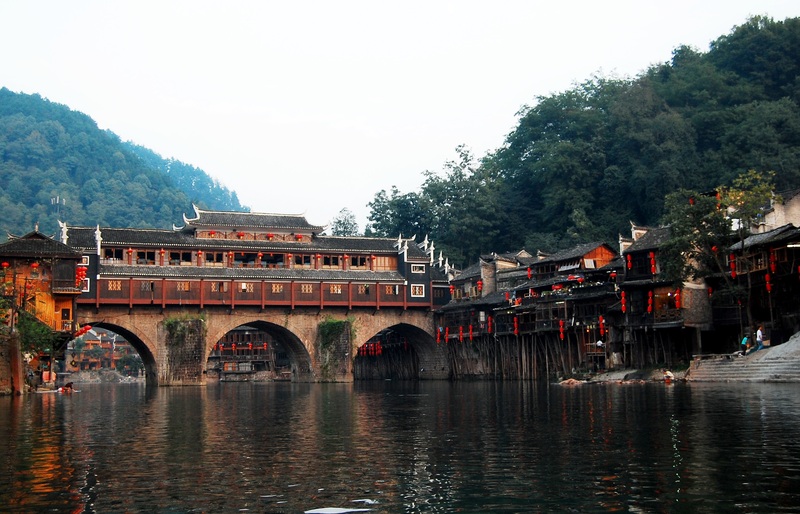 Photo taken of a three-span bridge in the scenic FengHuang ( Phoenix City ) of China – another three-span bridge with buildings in the superstructure. Bridges are so fascinating, I regret I did not have the chance to pursue further my skills in bridge engineering in my later career. They are just lovely work of science and art! All these bridges bring back good memories of my earlier career which I still cherish!. Michael, beautiful photography and excellent post! I love how you portrayed each one. Recently I’ve been interested more in reflections and your reflections from your bridges may be something I may want to paint after I finish my present project! Well done, thank you! This post was so beautiful, I made happy noises while I was reading it. Thanks! And can’t you give us some of your own bridge designs, sketches, initial drawings, and blueprints? they would be fascinating, even more than the bridges already all built. Such an interesting variety of bridges. With your previous experience, it must be even more interesting to you to look at these structures, evaluate and appreciate them…. they are all fantastic, I am not sure which is my favourite, maybe the one in France with the mist rising around it..or wait…maybe the first one, in Spain. All wonderful shots. Reblogged this on SEN BLUE LOVE LANE. Thanks for reblogging this on! I have always loved bridges but wasn’t sure why. You are right – they are an interesting blend of art and science. Michael not only a stunning collection of photos but so special that they reflect your own personal history. Also many thanks for following my blog and the recent like. Your feedback means a great deal to me. Hi Sue, you are welcome. Thanks for visiting my post too! These are wonderful and even more so when one realizes your special expertise when it comes to bridges! I know you didn’t ask but I have to say my favourite is the smaller Chinese 3 span bridge with the perfect reflection – so serene as you say. Lovely post, Michael. What a wonderful job to design bridges. Hi, the bridges I designed were more plain and functional. Thank you, Catherine! Thanks for sharing those nice photos and stories. Hi Irene, I am so glad that you have always been perusing my posts and commenting – this is a great encouragement for me. Thank you! I like to explore the world, and right now, I can’t travel, so I enjoy so much to be able to explore through your beautiful photos. Thank you Michael. Denmark is pushed up much more than it deserve at this time. The most different you will find in Denmark is the mentality, if you visit nice places outside the big cities. Mostly are more friendly there. I think that big cities are more or less equal. I Love the bridge art .Thank you Micheal. 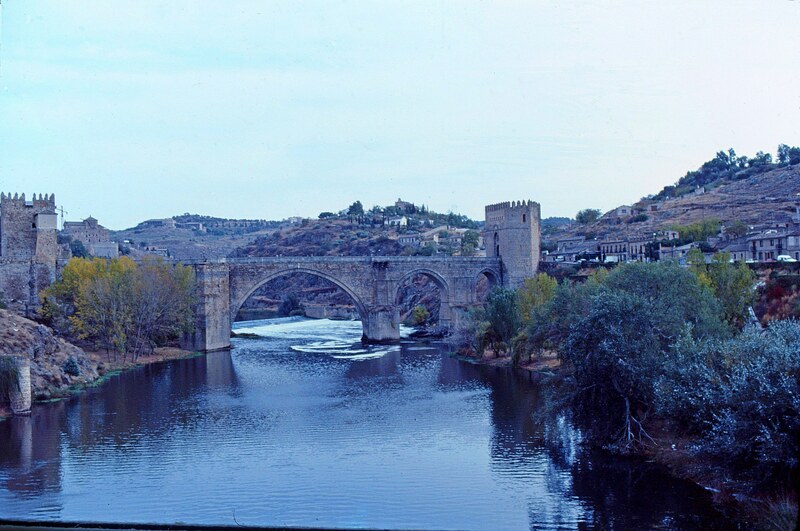 My favorite is the one in Toledo Spain, as a child of a military family I lived in Zaragoza and Madrid Spain..I remember a vacation we went to Toledo..I like to think maybe I crossed over that beatiful bridge. Is cement or other binding agents used for the arch bridges? Bridges: functional, asthetic, symoblic. Excellent photography subject. I have seen/croosed the bridges which you pictured in Seville (part of a large plaza, I believe from a World’s Fair, or some other exhibition decades ago) and Toledo. Just to the right of the entry turret, across the street is a fabulous local restaurant, La Cava. We enjoyed it so much, we dined their three times. 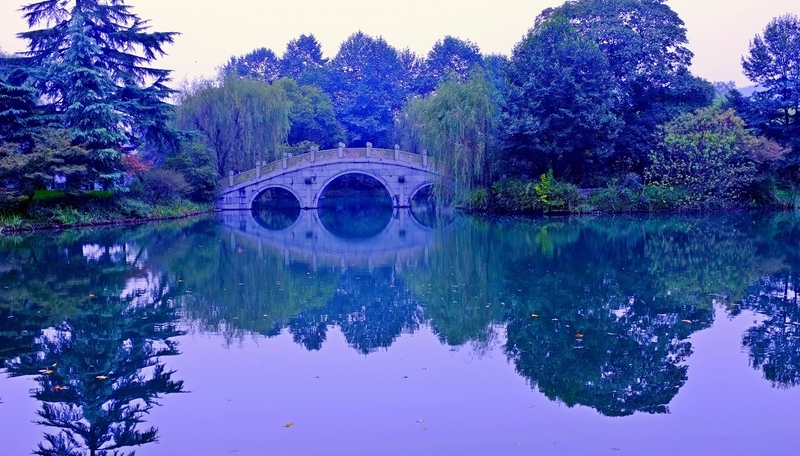 Many more bridges to admire and cross in our life time. I love your photography. You have a depth in your soul that comes out on the canvas. Thank you for sharing and if you’re ever in the US around the KY area, let me know! I would love to talk with you about your photography. Hi Sheila, I am flattered by your comment; photography could be a vehicle to bring out what is in one’s soul. I have never been around or near KY. Only God knows whether I will pass through KY one day. Of course if that day comes , I would like to talk with you on my photography ( please note that I am only an amateur), for now, you are always welcome to talk to me on this platform. Best wishes to you and your loved ones in 2014! Your post reminds me of other similar bridges, I may pot them later. thank you! Exquisite!!!! Thank you for noting the previous post and journey, I enjoyed it and both posts give me a greater sense of your “structural eye”!!!! My husband is a retired utility engineer, “power lines,” so when we are out and about town, I get to hear about the various stories about the power lines and “substations” as works of functional art!!!!! [ Smiles ] A beautiful photo collection of bridges. Wonderful photos showing the beautiful structures, Michael. Love the superb reflections in many of the shots too. A joy to see in photos – must be even more spectacular in life. Yes, they are one of human’s most creative and breath taking structures! You are amazing! I didn’t know of your background in the field of building bridges. Now with your blog, you are building bridges among countries. Pictures are fascinating, but so are you! Lovely, especially your take on that second one, the Venice bridge. Beautiful images, I love the variety. I really enjoyed the bridge pictures. Makes me want to take a trip. Thanks for the like on the Harley Factor today. Hope you will stop by again. Michael, every trip to your blog gives me double pleasure: I enjoy several posts and then I pick up a post to reblog so that my followers could enjoy it too. I am sure they will like this post. Thank you, Michael. Hi JF, I feel honored to be reblogged; thanks so much for that! Michael, thank you for giving me so many wonderful choices! Thank you JF for your continued perusal and commenting. Have a great week! Hi Michael, great photographs I´m seeing here, you sad you used to be a bridge designer but maybe you really where a professional photographer….I decided to stop and comment on this post since I´m from Spain and as a faithful Spaniard I have to, have to, say that the best photo is that of the bridge in Seville. I have to sorry. But kidding aside, you have a great eye for photography and the other photos where beautiful. I´m glad you stopped by my crazy un paid blog. 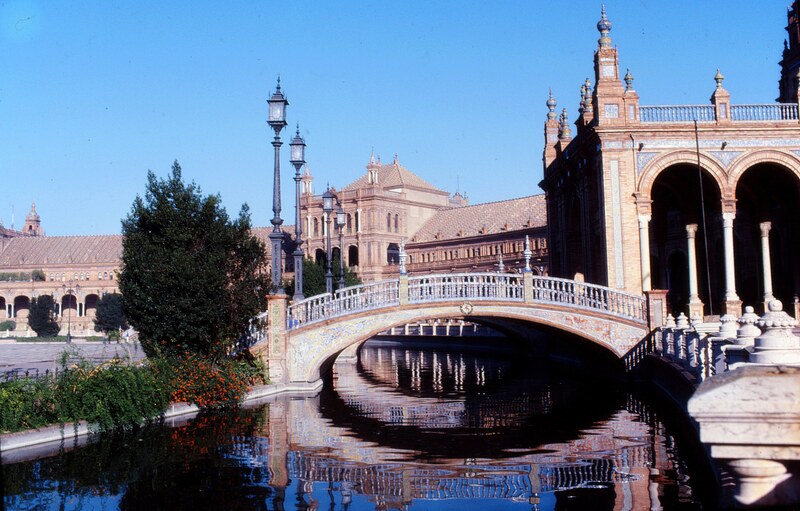 I have posted a photo of a bridge in front of the Seville palace, that one is real beautiful! Right now, I am learning Spanish, the grammar of which I find quite difficult. I love bridges and piers. Mostly of the wooden type but stone brings it’s own level of joy. They can be so asthetically pleasing to the eye. Particularly liked the Seville bridge with reflection and the Velentre bridge in France. 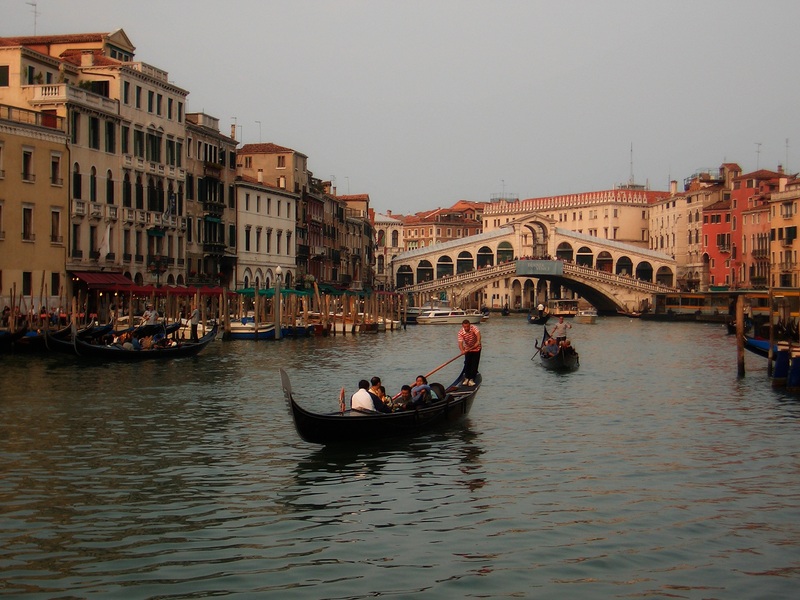 I’ve been lucky enough to walk on the Rialto bridge in Venice which was a treat. Thanks for an interesting post. I’m off to explore your link now. Beautiful gallery Michael but the next post is just spectacular and such an engineering feat! Hello, Michael. I was looking if you have some posts on Spain travel, as I am leaving on Saturday for a Spain vacation , so I found this post, very beautiful bridges! Which bridges did you design?curious mind wishes to know. Good that you will be travelling to Spain soon; look forward to seeing your posts on Spain. The bridges I designed are all in HK- some footbridges, some vehicular bridges and even a couple of railway bridges. They are not that exciting. For the last 15 years, I have always been travelling over two of the bridges to / from work everyday. I also travel on the railway bridges if I take the train to town. I have always wanted to design bid bridges but it has not materialized. Ha ha, I seldom did this, but curious. I checked your profile under Linkedln. One more coincident: La Salle 仔！My brothers are all La Salle 仔。but they did not study in HK . Actually your projects were exciting. You were just humble. Keep bidding! I am basically retired. My “work” does not require me to be physically present in an office. I am enjoying my new phase of life. Glad to know that your brothers studied in La Salle too. Have a good trip, Denise! I look forward to my vacation soon. Will still be online and follow my favorite blogs! My firm worked on the anti-suicide schemes of the Golden Gate bridge! Good to be in touch even in your trip. Safe travels!